There's something so incredibly lovely about using something that you made yourself on a daily basis, isn't there? I have lusted after a Traveler's Company Midori Notebook for a few years now, but I could never convince myself to buy one because I wasn't a huge fan of the odd size. It's narrower than a standard notebook, with the intent that it could fit in a pocket. However, as a woman, pockets are hard to come by, let alone pockets large enough to fit any notebook! I knew that if I owned one, I would carry it in my purse, and if so, I'd prefer a more regular size. This logical response to an emotional want for a product had me stunted - I still wanted the notebook, but kept managing to talk myself out of one. For a while, I tried a cheaper alternative in the Webster's Pages Traveler's Notebook (I had the Walnut version), but I didn't manage to stick to it long. I had no use for the pockets and while it fit a Moleskine Cahier, it didn't fit a hardcover A5 notebook like a Leuchtturm. That inconvenience forced me to spend hours researching very specifically sized notebooks which, for the most part, did not exist. I wanted my notebooks to be smaller, so if I made mistakes, I could swap them out. I also began to wish for a notebook to house all of my calendar doodles. I imagined flipping through them at the end of the year, one after the other, without any need for flipping back and forth. Finally, I wanted a system that would not force me to redraw the spreads I wanted to keep for an entire year. 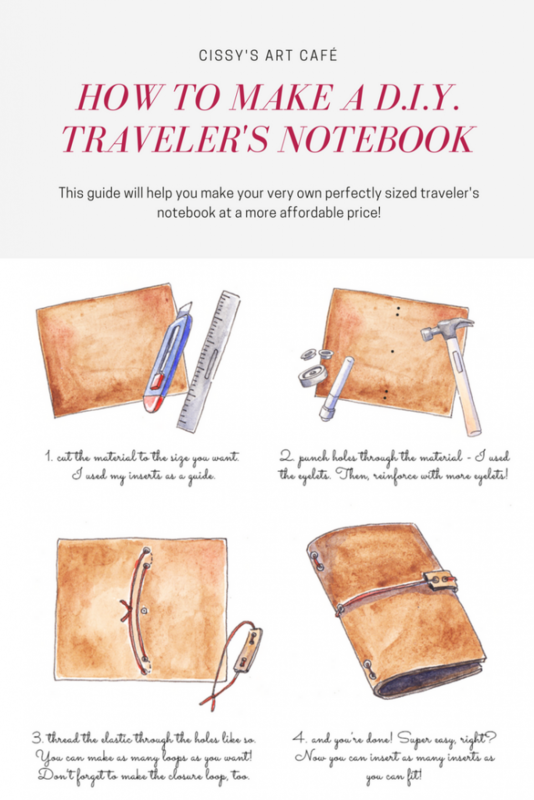 A traveler's notebook system began to sound better and better. The final thing that spurred me into action was this tutorial video, by lovely YouTube creator Christina (@my.life.in.a.bullet). The simplicity of how she constructed hers was enough for me to realize that the system was, in fact, extremely easy to D.I.Y. Step one was to create my inserts. I had a lot of scrapbook paper from previous projects to use as the cover, and after a lot of careful consideration I selected some dotted Rhodia paper for the interior. I am a fountain pen lover, and I wanted the pages to be able to withstand my fountain pen ink. The paper needed to be pre-dotted. While I have created dot grids on my computer before, I did not want to deal with the hassle of printing my own. I wanted it to be easy, and so, pre-dotted paper was easy. I wanted the paper to be accessible, in case I ran out and forgot to order more. In New York City, Rhodia is carried by Blick's, Michael's, and Kinokuniya, three supply stores that I frequently make excuses to visit. 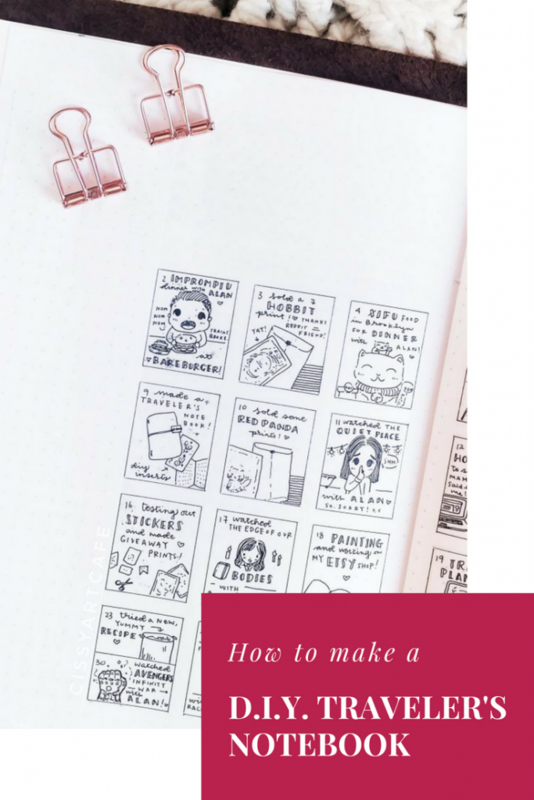 I wanted my inserts to be thread-bound instead of staple-bound because I intend to bind all of the inserts together at the end of the year as a keepsake, so I needed to be able to easily remove the binding method. Plus, I personally think thread is prettier, and staples would leave holes I didn't want to keep. Due to that decision, I needed to buy some bookbinding needles and some beeswax to reinforce the thread. P.S. In case you are concerned about the ethics around using animal byproducts, today's bone folders are generally made out of plastic, not bone. Be sure to check with the supplier first before you purchase! Step two was to make the cover. After spending a non-negligible amount of time deciding between faux and real leather, I ended up selecting real leather as my cover material. Of course, if you are making your own, do your own research and decide on your own ethics before purchasing any material! I selected real leather because from the research I looked at, affordable faux leather is really bad for the environment to produce. I also really wanted to support a fellow Etsy shop owner, and most of the faux leather I saw on the site was mass-produced in China. The leather I ended up selecting was this one, which I find to be lovely to touch and beautiful to work with, especially as a first-timer. I would like to note that I ended up using the eyelets to force holes into the leather. In doing so, I destroyed quite a few eyelets! You should probably use a leather punch unless you don't mind wasting a little bit of metal. I also ended up looping the elastic through many more times than pictured, for a total of 6 elastics inside! P.S. The holes I punched are about half an inch from the edge, and then another half inch inwards for the second hole. 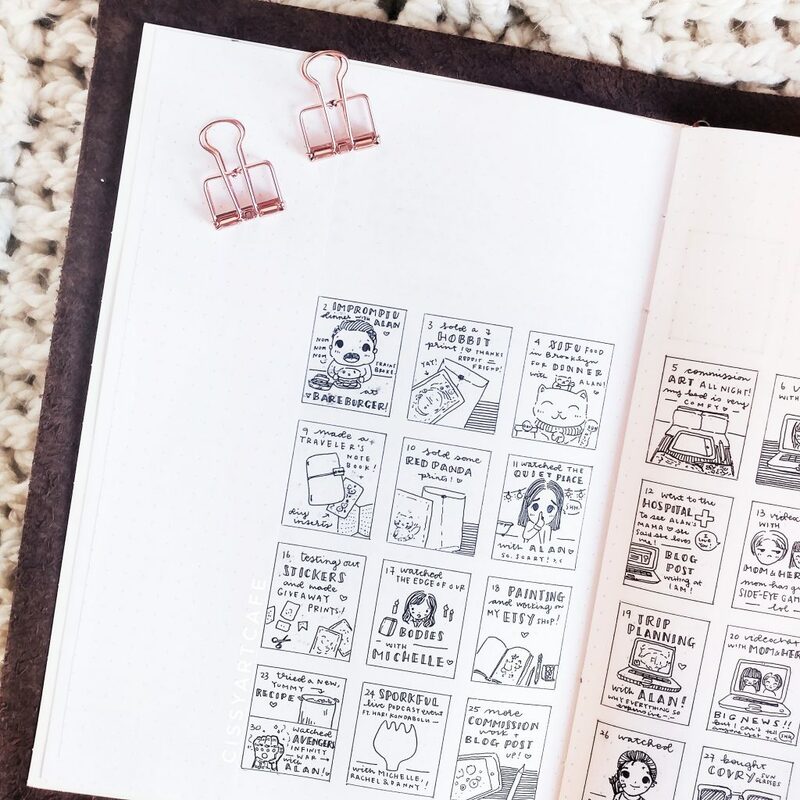 I have now been using a fully D.I.Y system for the past two months and I am completely in love! The flexible system really works for me, and while I currently have a mass-produced sketchbook stuffed inside, I will be switching it out for some loose-leaf paper when the sketchbook is fully used up. 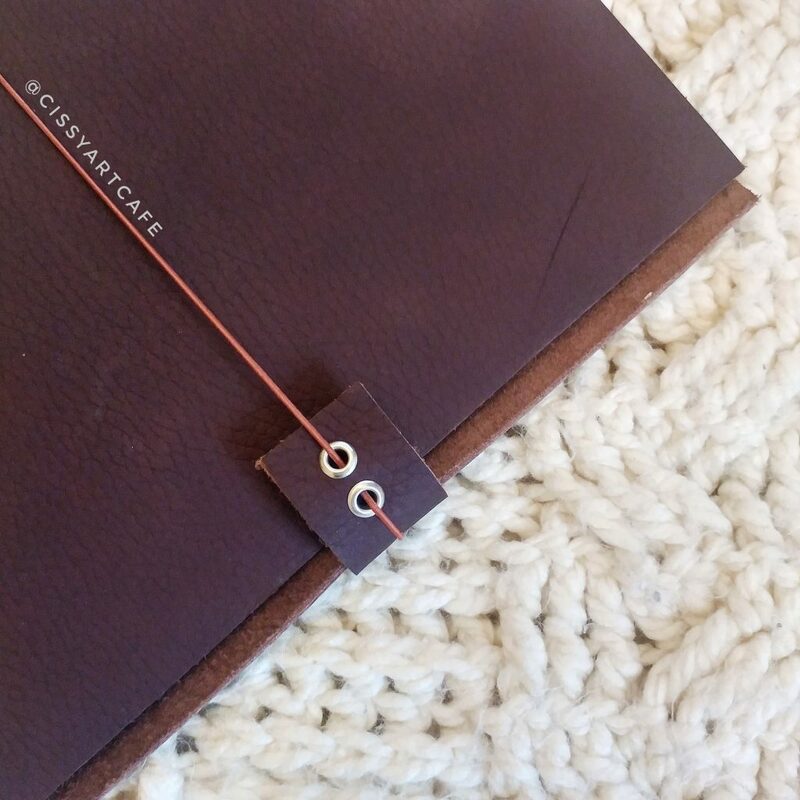 The leather cover has been holding up really well, along with the notebooks and elastics inside! The leather had some natural wear when I received it, and has been getting properly worn in. I'm excited to use this cover for many, many years to come. I do hope that you end up trying out this system! 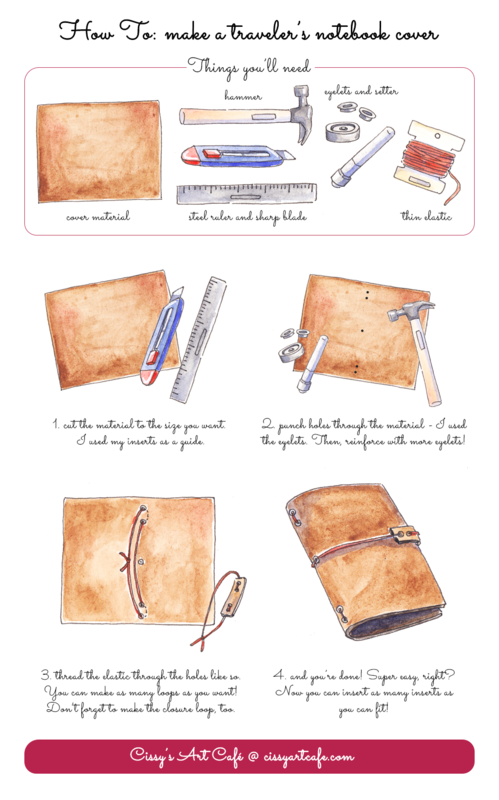 If you make your own D.I.Y, please send me a picture by tagging me on Instagram or on Twitter, whichever you prefer. 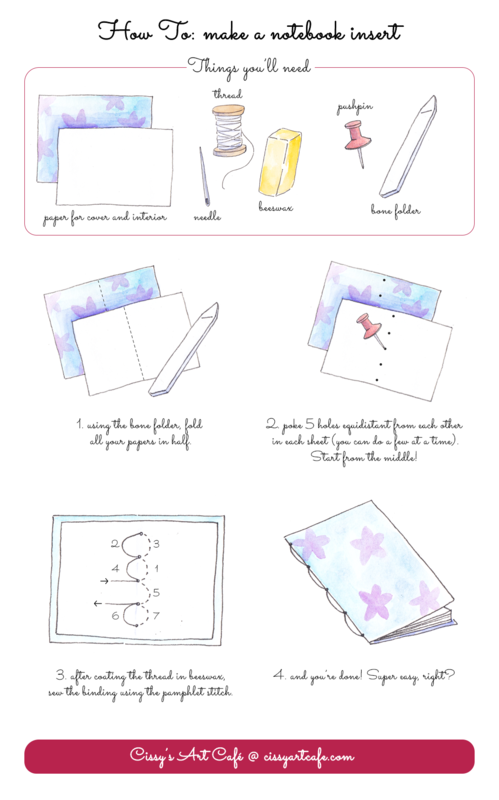 Also, I do plan on making printable inserts for DIY notebooks, so let me know what kind of inserts you're most interested in.